Kieran Trippier feels the belief in the dressing room will be vital in six cup finals. Burnley are two points adrift of safety after Saturday’s 1-0 defeat at home to Arsenal. But, ahead of the trip to Everton at the weekend, Trippier insists the Clarets won’t give up the fight: “We knew it was going to be difficult coming into this league, and if you look at the start of the season, we didn’t win a game or score a goal, and people were writing us off. “But we’re still there, still fighting, and they’re six massive games now, which we’ll take game by game as we have done all season. “Hopefully we can get the points we need. 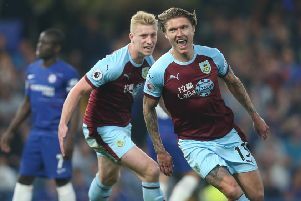 Burnley have played the top eight in successive games, and now face teams predominantly in the bottom half of the table in their remaining six fixtures, and Trippier added: “We’ve got teams around us and we’re all fighting for the same thing, so we’ve got to just believe in ourselves and as individuals and hopefully that will take us through. “All the teams have spent millions, like it was in the Championship, so we knew it would be difficult but we’ve all stuck together after the first tough 10 games. “Most of the boys hadn’t played in this league and we were finding our feet, but we stuck in there and the belief has been brilliant even when we’ve not been winning games. The former Manchester City youngster was frustrated to lose to the Gunners: “The goal we gave away, there was a bad pass in the middle, but I thought we could have defended it. “But that’s the difference in that league, you give chances to a team like Arsenal and they put it away. “We had a couple of opportunities and it didn’t happen for us, and that’s why we’re disappointed. “I was speaking to Heats and I can’t remember them testing him. Second half Sanchez had a good opportunity, but apart from that we defended well, got our blocks in and we’re disappointed we didn’t come out with a point in the end. “We’re playing Arsenal, a world class team, we’re just frustrated at how we conceded the goal, and that’s what hurt us.